This sub-genre of comedy generally includes a group of characters who would unlikely cross paths beyond their workplace but naturally do because they all need to pay bills, and as a result, a day in the office, car wash, ambulance, or any other agency of employment, contains more entertainment and perception than you would expect from “a day in the life” comedy. While the Workplace Comedy certainly has manufactured laughs and shenanigans, it also has an odd ability to capture the essence of the time and place through its characters, their interactions, and the circumstances they find themselves in because, after all, you learn the most about the people and their generation by their behaviors at home and their behaviors at work. Through this caricature approach, Workplace Comedies boil down and present the social dynamics of an era, making them a fascinating snowglobe of a moment in the past. Sure, larger, more philosophical themes may exist in them, but they are hardly ruminated upon, and as a result, plenty of ideas and comments on the times are packed into fast sketches, conversations, and moments into a fluid journey that may not lead to a climax or denouement but will give you a sharp insight into the characters’ times and a history of American culture. 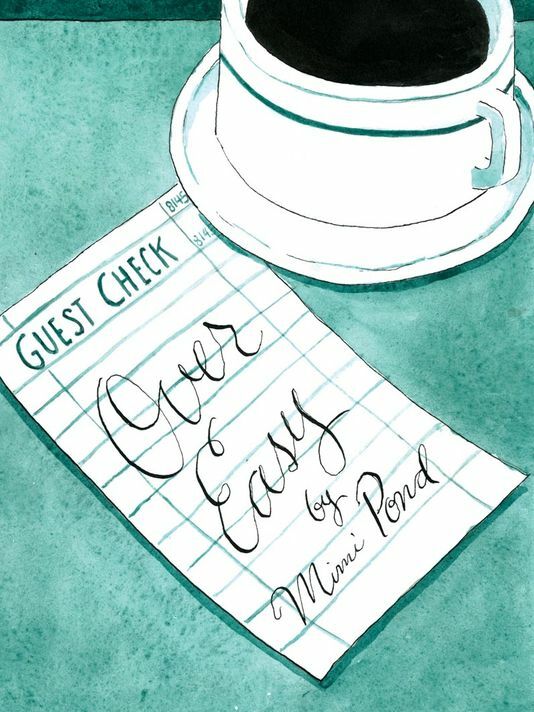 Though in graphic novel, semi-fictional memoir form, Mimi Pond’s Over Easy falls into this Workplace Comedy bin. Paced almost like 1976’s Car Wash in its looseness with its characters, Over Easy captures the spirit of Oakland, California and America in the late 70s through the employees and clientele of the Imperial Cafe. Richard Hell called the 70s the Blank Generation, and Mimi Pond’s characterization of herself and her colleagues in Oakland in in 1978 would agree. Given that the fluidity of an experiential yet condensed (a term which our dear friend Mitch uses to describe the aesthetic of the 70s) film such as Car Wash relies on the time-based nature of the film form, Pond’s graphic novel interpretation of the form depends on her narration of her young adult self to guide you smoothly through the big and small moments in the Imperial Cafe, which minimizes the frenetic energy that devours you in Car Wash but prevents the novel from feeling too chaptered in its depictions of different events in the diner. As a result, Over Easy could be interpreted as an alternative bildungsroman for a budding female cartoonist who works in order to pay for her last year of art school and accordingly must learn how to live in the real world outside of the protective, pillowy walls of art school; however, the cast and crew of the Imperial steal the spotlight in Over Easy, making Mimi, or Madge (Pond’s Imperial Cafe moniker given to her by Lazlo, the manager), more of an omniscient narrator to the Workplace Comedy of a diner with hip waitresses in vintage dresses, surly cooks, and eccentric management who all serve premium Americana food to unusually good-looking hippies, freaks, and punks. Beyond all of the relationship and sexual do-si-does between the various staff members of the cafe to tingle your prurient interests and also remind you of how incestuous contained groups of men and women can be (call in flashback to different social groups you were a part of or observed in high school, college, or life), Over Easy also brushes upon the precarious state of confidence and utter confusion of the late 70s. Through the clients and the employees of the diner, we see the rejection of hippie culture, disco, and political revolution and the embrace of the sexual revolution, punk, and a general distrust but passiveness toward the U.S. government. In turn, the crew of Over Easy have an overall ennui toward their own futures but indulge in their senses in the now. They are hedonistic; they are vulgar; they are self-obsessed; they are over educated in a field that probably adds no practical knowledge to the work force; they are prime for an awakening or a complete submission to the middle, the average. Beyond only recounting the cultural shifts of the late 70s in the vacuum of the Imperial Cafe, Over Easy manages to document the roots of the modern day hipster. Consequently, I must admit that I cringed a bit when I saw various characters attempting to live a blue-collar life even though they served gourmand diner classics to everyone but factory and construction workers and anyone of color (with the exception of three belligerent, drunk black women, and I’ll leave the interpretation of that scene to you and how it relates to the surge of the squeaky clean 1980s), but these moments remind us of the contradictory nature of the time and how it has come to influence today. By including herself in the narrative during her integration into the Imperial Cafe climate, Pond captures the outsider’s fascination of the exterior of this pseudo-bohemian world and the less glamorous insider’s perspective into its hollow and confused middle, making Over Easy less of a rosy eyed work of nostalgia and more of a relevant observation of the chaotic life in Oakland and America at large in the late 70s.